NEXT | How do you play with others? 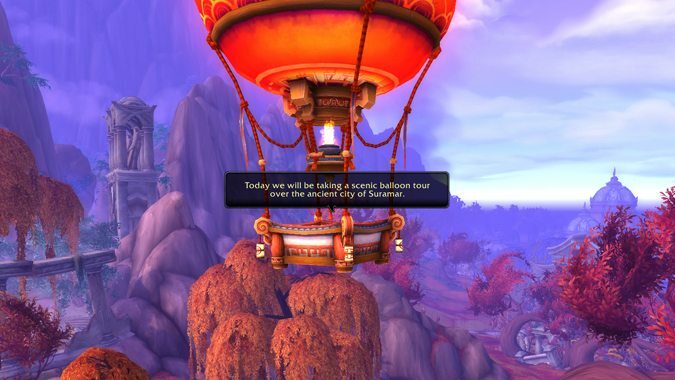 On the one hand, I think the Spring Balloon Festival is my favorite micro-holiday so far. I mean, you get to kick back and listen to a tour guide take you through various points of interest in various areas around the world. Relaxing, right? The only drawback to this is that you have to have three people present before you go on a ride. If nobody else happens to be around, you’re out of luck — and that doesn’t really feel very good. I wish it’d just let you hop in solo if nobody else happens to be nearby. Maybe next time they’ll have that option? Let’s hope so. When Sageras destroys evertything does that include himself? Is this an elaboate suicide? If so, what’s in it for anyone else, i.e. all the commanders, lieutenants, etc in the burning legion? Yes, it includes himself — it includes everything. As far as Sargeras is concerned, even a dead universe is better than one controlled by the Void. It’s not so much a suicide as it is trying to manually wrestle the reset button on the universe. Life already popped up from nothing once before, it would eventually do so again — this time, hopefully without the Void’s influence. In other words, he isn’t trying to enact some kind of cosmic suicide so much as he’s attempting the tried-and-true method of turning it off, and turning it back on again. So far I’ve only seen the blue dragons and Ysera doing anything in Legion. If this is such a dire thing where are the other flights? Keep in mind that the dragonflights lost a great deal of purpose and power at the end of Cataclysm. They also lost a lot of future progeny — the Twilight’s Hammer managed to corrupt the eggs of pretty much every dragonflight in the sanctums beneath Wyrmrest Temple. Korialstrasz sacrificed himself and destroyed the sanctums in the process, wiping out all of the corrupted eggs before they could hatch into chromatic dragons. So it’s not like there’s a lot of dragons left to come join the fight. But realistically, the events of this expansion have far more relevance to the Blue and Green dragonflights than any of the others. It’s been a while since we’ve seen either flight get any kind of significant focus, so it’s simply their turn in the spotlight, right now. The others are probably out there, fighting their own fights in their own way. We might see them pop up at the end, we might not. How do you think Wrath could have differed if we had Chronicle lore back then? Well…we did, kind of. The lore reveals in Wrath kind of naturally led into the big reveals in Chronicle. All of the stuff we discovered up in the Storm Peaks and the Ulduar region was significant, we just didn’t realize how significant. All of the information was there, we just didn’t have every piece. Personally, I think the mysteries were part of what made Wrath so compelling — if those mysteries had been revealed the second we arrived, I don’t know if the expansion would’ve been as interesting, story-wise. Q4tQ: artistically, what is your favorite Legion zone? It’s a tie between Val’Sharah and Suramar. I’m a sucker for good landscapes, and Val’Sharah is just crawling with gorgeous plant life. The contrast between abundant green and Nightmare-infested areas is appropriately jarring. With Suramar, it’s all about the city — it’s absolutely beautiful. The architecture is so well done, and the city has so many little hidden artsy, gorgeous vignettes tucked all over the place. I love it. Q4TQ: Why don’t the Alliance and Horde attempt to assault the Wrathgate again? It’s not like the setback suffered there prevented another attack, especially after the battle for Undercity eliminated the Forsaken rebels. Well…that whole pesky situation was taken care of back in Wrath, so technically we don’t really need to assault the Wrathgate again. But I’m pretty sure — back then anyway — that the Lich King probably sealed that entrance off once he realized it was a liability. Beyond that, you have to realize that the events at the Wrathgate were pretty much the spark and catalyst for all the tension between the Alliance and Horde in the years that followed. Putress killed Highlord Bolvar Fordragon. That man was a hero, a really big deal to the Alliance, and his death hit them all greatly — especially Varian. There was no way the Alliance and Horde were going to work together after what happened at the Wrathgate. Putress started that ball rolling with his attack and attempted coup, and Garrosh Hellscream put the final nail in the coffin with his actions and attitude as the leader of the Horde forces in Northrend.